Product #20747 | SKU AG-HPD24E | 0.0 (no ratings yet) Thanks for your rating! 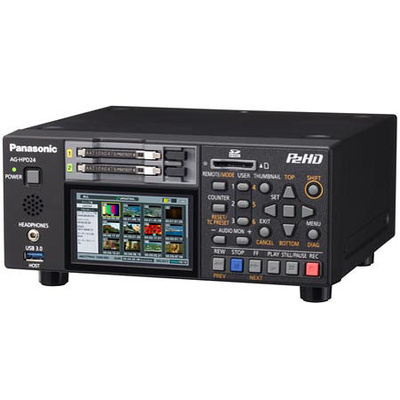 The Panasonic AG-HPD24PJ Solid-State P2 Portable Deck is a lightweight (at 2 kg) yet extremely powerful recording device for professional HD production. With outputs for HDMI and HD-SDI as well as composite video, the 1/2 rack-wide, 2 RU-high HPD24PJ deck can serve a versatile monitoring station as well as the heart of a logging station for production in the studio or, with its included battery, in the field. The deck has two slots for P2 cards and acts as a USB 3.0 device, so you can easily & quickly offload files to compatible hard drives. The AJ-HPD24PJ has a 3.5" LCD screen that shows not only thumbnails and live playback video, but also a waveform and vectorscope. The AG-HPD24PJ supports AVC-Intra recording at 50 and 100 Mb/s. This intraframe codec offers extremely high-quality compression that produces high-definition files whose quality can stand firm against multiple post-production passes. The deck also supports DVCPRO HD and, for standard-definition compatibility, DVCPRO50, DVCPRO, and DV. The HD codecs support 1080p, 1080i, and 720p formats, and with the deck's HD-SDI inputs, the HPD24PJ can input 1080/24PsF (progressive segmented frame) material and output it, making the deck appropriate for digital cinema productions. Featuring time code in and out as well as RS-422 control, the HDP24PJ thrives as an NLE deck as well as a component in a live-event environment, recording the feed of a switcher. Recording options are manifold, thanks the dual P2 slots: You can record to both cards simultaneously or in-line, and you can hot-swap the P2 cards. Auto Rec responds automatically to the presence of an HD-SDI signal, and Loop Rec keeps the recording going non-stop, recording over each card's existing contents in turn. Using the HDMI output and the HD-SDI input of two identical AG-HPD24PJ portable decks, you can set up a system that can record and play back separate left-eye/right-eye channels of 3D video. The AVC-Intra codec further advances HD production. It complies with the MPEG-4 AVC/H.264 international standard based on advanced image compression technology, and offers both superb image quality and highly efficient compression. It uses an intra-frame compression system to bring important advantages to professional editing. The AG-HPD24 can record in AVC-Intra 100 for maximum picture quality or in AVC-Intra 50, which adopts a lower bit rate, for versatile operation. It also supports the DVCPRO HD codec. AVC-Intra 100: With the same bit rate as DVCPRO HD, this mode gives you full 10-bit recording with 1920 x 1080 pixels. It captures master-quality video for high-end image production. AVC-Intra 50: This mode delivers video quality very similar to that of DVCPRO HD with 1440 x 1080 pixels, yet is able to do so at bit rates usually associated with standard definition (e.g. DVCPRO 50). AVC-Intra 50's lower bit rate doubles the recording time and cuts the data transfer time in half 1 . The AG-HPD24 can convert up or down between HD and SD or cross-convert between 720p and 1080i during playback. It also features an aspect conversion function 2 . The AG-HPD24 can extract active frames from VFR (variable frame rate) signals output by a VariCam and record them in 720/24p. VariCam-like 60p pull-down output can also be provided by playing back a video clip in a P2 card recorded in native 720/24p by the AJ-HPX2700, the AG-HPX500 Series, the AG-HPX370 Series, the AG-HPX170 Series or the AG-HPX250 P2HD camcorders 3. AVC-Intra mode features high-quality 24-bit digital audio recording. You can select either 24-bit, 4-channel or 16-bit, 8-channel recording. DVCPRO HD mode provides 16-bit, 8-channel, and DVCPRO 50/DVCPRO/DV mode includes 16-bit, 4-channel recording 4 . The P2 card offers a large capacity of up to 64 GB in a small, lightweight package. Its rugged design withstands even harsh professional use. It is highly resistant to temperature fluctuations, dust, impact, and vibration, and is free of the problems that are common in tapes, such as condensation, head clogging, and dropouts. The P2 card promises solid reliability and excellent mobility under the often difficult conditions of field recording. Because data is automatically recorded in blank card spaces, there is no need for cueing, and the risk of accidentally overwriting valuable data is eliminated 5 . In addition to continuous, double-card recording, the AG-HPD24 enables some useful recording functions that are possible only with memory cards. Hot-Swap Rec: Thanks to the two card slots, you can hot-swap P2 cards for continuous non-stop recording. With multiple cards you can record for hours without interruption. Auto Rec: This function automatically starts recording in response to SDI video input. Loop Rec: This function continuously records video data onto available memory card areas. When the card becomes full, older data is deleted to free up the recording area, resulting in loss-less, endless recording. When used with cameras for time-sensitive information gathering like weather and news reporting, the Loop Rec function holds the latest video data for a predetermined time period 6. Text Memo: When recording or previewing a clip, you can attach a memo (similar to a bookmark) at a desired location (up to 100 locations on a frame basis). The simplified editing function lets you copy a segment between memos and create a new clip. Text information can be added to a memo. Shot Marker: During or after recording, you can mark each clip with OK, NG, or another designation. Clip Metadata: This function lets you browse and edit metadata, such as the name of the camera operator and reporter, shooting location, and text memos. Text data can also be easily inserted by connecting a USB or software keyboard, and metadata files can be uploaded from an SD/SDHC card 7. Format Auto Playback: This automatically detects the video format and codec for each video clip to play back and output. Variable Speed Playback: For slow-motion and double-speed playback. PB Position Selection: This lets you select the playback position when playing from a thumbnail image. You can select from three different options: Previous playback position, thumbnail time code position, or the beginning of the clip. USB 3.0 (Host): AVC-Intra 100 codec files can be copied to external storage at approximately 4 times normal speed. USB 2.0 (Device): Device mode allows its use as a P2 card drive for a PC (nonlinear editor). HD/SD-SDI input and output terminals are provided as standard equipment. This enables high-quality line recording using signals from a video camera or a video switcher. When connected to a camera recorder, the AG-HPD24 syncs Rec Start/Stop with the camera trigger. On-Screen Display (OSD) and thumbnail displays can also be output 10. The AG-HPD24 has Ref input, analogue video (composite) output, XLR analogue audio inputs (Ch 1/Ch 2), audio monitor outputs (L/R), time code input/output, and a headphone jack11. Dual HD-SDI (left/right video) signals from a 3D rig-type camera system or an integrated twin-lens 3D camera, such as the AG-3DA1 or AG-3DP1 (scheduled to be released in Winter 2011), can be sync-recorded on two AG-HPD24 decks (left image on the first deck, and right image on the second). The AVC-Intra codec records high-quality images with full-pixel HD and full sampling data for both left and right channels for high-end 3D image production 12. The left and right images from two AG-HPD24 decks can be played back in sync. HDMI output is possible to a home-use 3DTV, or HD-SDI dual output is possible to a professional 3D monitor or projector. Using the control panel of the master (left) AG-HPD24, left/right sync operations include Rec Start/Stop, Clip Thumbnail Display, Clip Playback (including variable speed playback), Clip Delete, Text Memo, and Shot Marker addition. This makes 3D images as easy to handle as 2D images 13 . 1 Resolution figures are for 1080i/p mode. The AG-HPD24 also supports 720p mode. 2 Only cross-conversion is available in 3D mode. Also, the closed caption signal in the SD signal is not output during up/down/cross-conversion playback. 4 To play video clips recorded with 24-bit audio, use a 24-bit-compatible P2 device or P2 viewer. A P2 device that is not 24 bit compatible will display the clip number in red, and playback will not be possible. A P2 viewer that is not 24 bit compatible will not produce normal sound. Use the latest P2 viewer version. 5 Total card capacity includes space for data management such as system data; therefore, the actual usable area is less than the capacity indicated on the card. 6 Loop Rec is not supported in 3D mode. 7 The simplified editing function is not supported in 3D mode. 8 Clip copying not supported in 3D mode. 9 High-speed transfer not supported in 3D mode. External storage of 2 TB or more cannot be used. 4x speed figure applies to AVC-Intra 100 and DVCPRO HD. P2 playback is based on disk drive performance, including spindle speed. Panasonic cannot guarantee smooth playback without dropped frames. 10 Output of thumbnail displays is not supported in 3D mode. 11 Analogue composite video is not output when the system frequency is 24 Hz. Also, the left image is output during 3D mode. 12 3D recording is possible only with the AVC-Intra codec. 13 For Rec Start/Stop and Clip Playback, external remote control is also possible via the RS-422A terminal.